One of the things that speakers seem to forget is that our audiences are made up of bright, smart people. What this means for you is that even as you are speaking, they are going to be mentally racing ahead of you. What this means is that they are going to be picking apart what you are talking about and they’ll be realizing that there are costs and drawbacks to what you are discussing or proposing. If you don’t touch on these issues, then you’ll be leaving some very big unanswered questions in the minds of your audience when you are done talking. The best way to deal with this issue is head on – discuss the downside of your proposal. However, since you are the one who is bringing it up, you get to control how it gets discussed. This means that you can discuss it in the most positive way possible. One clever way to go about doing this is to focus on just how expensive it would be for your audience to not take your advice or to not follow your plan. This might serve two purposes: you’ll deal with the downside of your proposal and you’ll convince your audience to accept your proposal. When you are dealing with a business audience, one of your biggest challenges will be to keep their attention. You are probably addressing them in an office environment and there are a number of other activities that will be competing with you for their attention (like smartphones). What this means is that you need to make the effort to keep focused during your presentation – you are going to want to be very, very specific about what you are talking about. You want to make sure that at no time does your audience have to work to understand specifically what you are getting at. This also means that no matter how tempting it may be, you need to be sure to not wander off subject. At the same time you need to make sure that you don’t start to talk in generalities – keep your presentation sharp and on target. 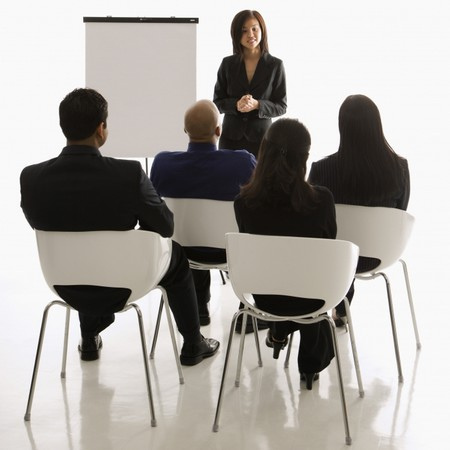 Making a business presentation to a group of senior managers can be both a nerve racking and a career limiting event. You can do this successfully; however, in order to be successful you need to do the right things and not do the wrong things. You need to realize that your audience is going to be thinking about what you are saying and they will be able to quickly identify any downsides or costs associated with your presentation. Make sure that you deal with these issues right off the bat and do so in the most positive way possible. As you make your presentation, be as specific as possible – stay on target and be sure to not wander. The ultimate goal of any speech that we give is to change the world in some way. Giving a business presentation to senior management allows us to make this happen if we take the time to do it correctly. Question For You: Do you think that there is a maximum time that your speech can run for when presenting to senior managers?